I coloured the duck stamp with markers (so my ducks could have cute orange beaks!) and stamped two of them. There are framelits that coordinate with the Something for Baby set so you can cut these out quickly and easily and, if you buy the framelits and stamp set in a bundle, you'll get a 15% discount! I used my 2 1/2" circle punch to make a mask and sponged inside it to create the sky. The wavy paper is from the Moonlight Designer Paper stack and I thought it would make perfect water for the ducks to swim in. The card is finished with a tiny heart, cut with the Owl punch, and a sentiment from A Dozen Thoughts. and was quacking along to the music! My fault apparently for putting it in his Christmas stocking! Another sweet baby card :-) , so simple but oh so cute!!! 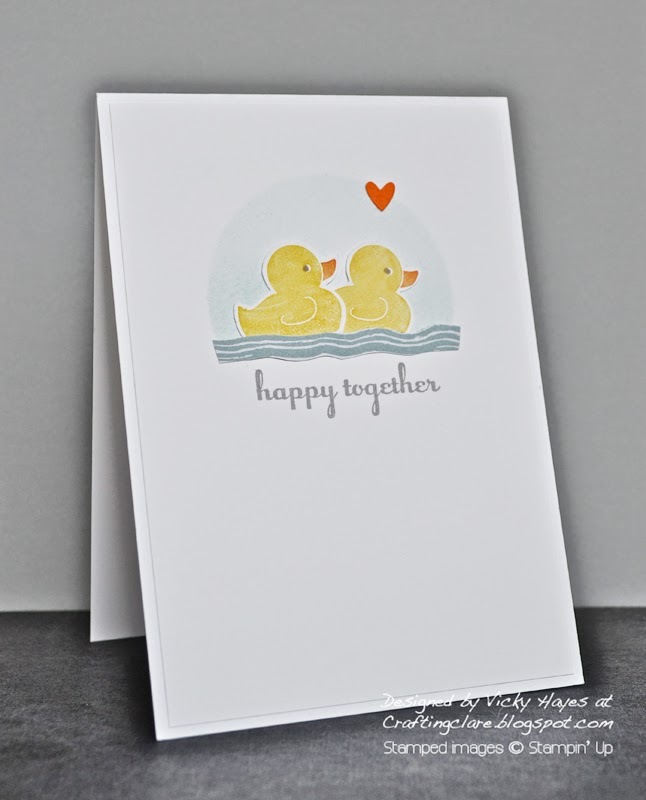 An adorable CAS card - those ducks are so very cute. I hope you had the massive baroque candlesticks out on top of the piano and a long sleeved frilly blouse on while you were playing . . . This is so sweet! The key ring reminds me of one I have, except mine is pink for breast cancer awareness, a cause close to my heart because I had a scare 4 years ago.